This is my mom, and my siblings and I as kids. We were wretched beasts. Well, except for my sister. It’s like blind justice, but with cooler sunglasses. If anyone wanted to try to define the duality of my personality, this strip could be a good start. Some days there is nothing more that I love than really silly half-baked jokes. Don’t get me giggling, or it’s all over. a Little Dee book online? As they say, don’t make fun of the folks as you go up the ladder, because you may be them on your way down. 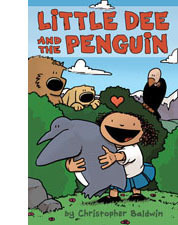 “Little Dee And The Penguin” is in stores! Whooo-hoooooo! Little Dee book available for order on most online retailers including Amazon: Little Dee and the Penguin in both soft and hard-cover! Or request it in your local bookstore! 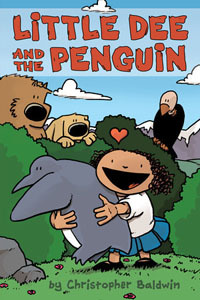 “Little Dee And The Penguin” is in stores today! Whooo-hoooooo! Little Dee book available for pre-order on most online retailers including Amazon: Little Dee and the Penguin in both soft and hard-cover! Or request it in your local bookstore, due out April 5th! Snow came quickly and left quickly in Reno. Maybe not QUITE this quick, but close.